Would you like people to rave about your business? Wouldn’t it be nice if customers fall in love with your brand? 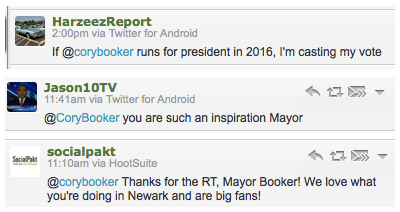 Fans are raving about Newark Mayor Cory Booker, despite numerous challenges facing the city. On December 31, 2009, the city of Newark was hit by a terrible snowstorm that left thousands of residents stranded and concerned about their safety. 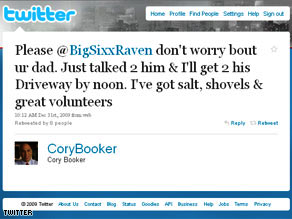 Mayor Cory Booker does a remarkable job using social media to connect with his constituents. One hour later, the mayor showed up at her dad’s house and shoveled out his driveway! Perhaps you’re NOT even thinking about creating a likeable brand. In this tough economy, you’re struggling just to get the word out about your product, drive sales and accomplish all of your other business goals. What if I told you that this book could teach you how to do both? 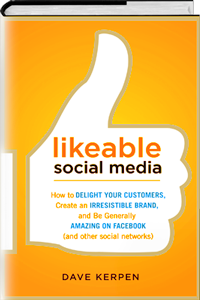 Here’s what you need to know about Likeable Social Media by Dave Kerpen. Dave Kerpen wrote this book to teach brands how to use social media to achieve likeability, transparency and responsiveness in a digital marketplace. Consumers like to share with—and feel connected to—brands, organizations and even governments that they like and trust. In the book, the author reveals 18 key principles that will get people raving about you and your products, while helping you achieve all of your other marketing objectives. The book consists of 249 pages arranged in 18 chapters. It is lavishly illustrated with fascinating stories of social media successes and failures. Whether you’re a general reader or a serious social business strategist, expect to be motivated by its relevance, simplicity and brilliant style. How giving turns into receiving, and much, much more! Social media sites and tools are ever-changing. But there are certain principles that remain timeless. As tempting as it may be to join the conversation, keep in mind that communication is 50% listening and 50% talking. For more advanced listeners with a higher volume of conversations to listen to, consider using paid listening platforms such as Meltwater Buzz, Parature, Radian 6, Sysomos and Vocus. Remember to not just search for your brand name, but also for your competitors’ names and words and phrases that your customers use. As organizations grow large, they develop processes and models to enhance efficiency. Unfortunately those processes also make it difficult to be personal and authentic when dealing with customers. Be an “improv show,” not a musical—brands need to think less about putting on a show for their customers and instead focus on building an excellent team that is flexible, able to go with the flow, responsive and engaged. Develop an authentic voice—consider what your brand or organization is all about. Think about how you can convert your mission statement or About Us page into a conversation piece. Let the world know your company’s personality while showing that you truly care about your customers. Just be real—drop the PR-speak or legalese from your organization’s communication. If you sound robotic or scripted in your social media conversations, you’ll turn off customers. Let people hear your real, human voice in all of your interactions and they will trust you and even buy from you. The more valuable content you can share with your fans and followers, the greater the trust and reputation you’ll build with them. Start a blog to share resources, advice and tips that your prospects will find useful. Write white papers to solve customers’ problems. And don’t worry about giving away too much information. It’s rare that you could give away so much information that people could afford to do everything on their own. In any case, they’re not the experts, you are—and eventually they’ll need your expertise to help them solve their problems. How did you survive the toughest times? What kind of funny or interesting things have happened involving your customers or staff over the years? Which employees’ lives have changed as a result of working for you? Which charitable organizations has your company or its staff supported? Remember, stories humanize brands and make them ‘talk-able’ online and offline. And they can be told by anyone—customers, employees or management. They just need to be real. Have the highest-ranking person (or another executive) at the organization say it through a brief online video. Use the appropriate social media channel to respond quickly when a bad situation arises. Don’t stop at “I’m sorry.” Apologize individually to each person’s complaint and continue to follow up. By responding swiftly and showing that you care, you can take a serious mistake, turn it around and end up with an even stronger reputation than you had before! On social media, you’re not just competing with your real-life competitors; you’re competing with all of your customers’ friends and the brands they’re connected to. Provide unexpected value—try listening to conversations that are not necessarily about your company and then respond to questions not directly aimed at you. For example, Best Buy developed Twelpforce to answer people’s Twitter questions about electronic products. Create situations to bring people closer to your brand and strengthen that emotional connection. For example, Cisco Networking Academy delights their Facebook audience by actually allowing select customers to become administrators of their fan page (they have over 260,000 fans!). Sometimes a personal, unique response from a real person at a big company can really “wow” people, even more than the coolest contest or giveaway. Ask yourself how you can create conversations and situations that make people smile, while generating surprise. Remember, if you can truly reward your fans and followers, you’ll be able to energize a huge group of online advocates. Likeable Social Media makes a huge (and risky) promise in its subtitle: “How to delight your customers, create an irresistible brand and be generally amazing on Facebook” (and other social networks). But Dave Kerpen has expertly delivered on his promise and provided all the tools you’re going to need to become a likeable brand on and through social media. Like its title, the book is fun to read and highly engaging. Kerpen’s use of action items (at the end of each chapter) provides very helpful insights to the reader. My suggestion would be to keep a pen and pad handy to jot down all the ideas that this book will inspire. I also think that some people may dismiss it as your typical social media guide. “Who needs yet another book to learn how to use Facebook and Twitter?”, they will object. But unlike other books on this subject, the author recognizes that being likeable in the digital space is not as easy as it sounds. In fact, had this book been around back in 2008 when United Airlines broke Dave Carroll’s guitar, they might have done things very differently. Social Media Examiner gives this book a full 5-star rating. Over to you: Do you own a likeable brand? How have you used these or any other tips to delight your customers? Leave your comments in the box below.